Bodrum is blessed with a year-round warm climate, and it gets rather hot here in summer. This makes the turquoise blue sea of this southern Aegean town all the more inviting. 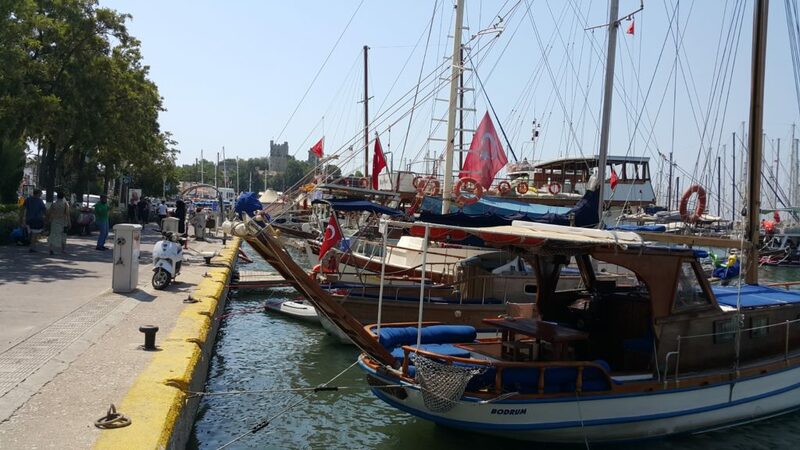 A lot of the life seems to revolve around the marina area, full of both beautiful old wooden sailing boats as well as fancy modern yachts glistening and swaying gently in the breeze. The seaside promenade is lined with pleasant restaurants and cafes, offering a variety of gastronomic experiences. My first stop in the town was at the Tomb of Mausolus, which sits by the rather unassuming street away from the seaside hustle and bustle. I would have travelled right past it without noticing it if Tolun hadn’t pointed it out. This is the very place where the word ‘mausoleum’ comes from. 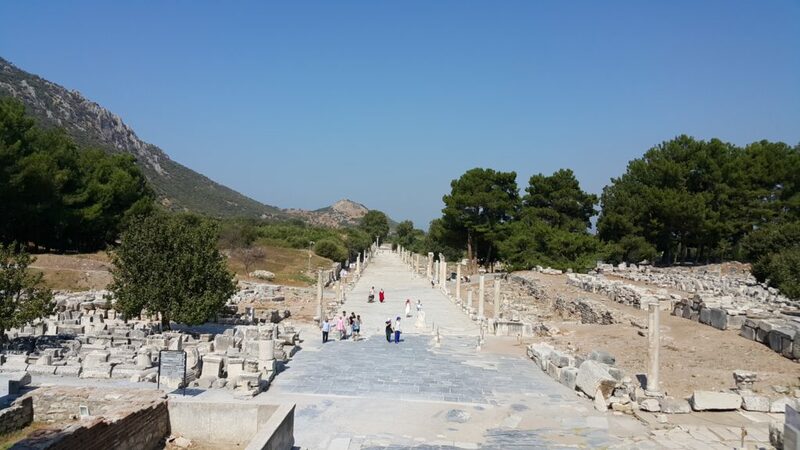 Mausolus was the ruler of Halicarnassus, which is the ancient name of Bodrum, in the 4th century BC. He and his wife Artemisia decided to make it the capital of their small region of Caria, which was under the rule of Persian Empire. He admired the Greek culture and commissioned Greek sculptors and architects to get a tomb built for him as a Persian satrap. After his death his wife Artemisia finished the tomb by employing some of the best and most famous masters of that time. The resulting masterpiece was so beautiful and artistic, with many sculptures of people and animals that it became one of the Seven Wonders of the Ancient World and Romans started calling all magnificent tombs ‘mausoleums’ after Mausolus’s tomb. It looked over the city for 16 centuries, collapsing after series of earthquakes by 15th of century AD. Consequently it was looted by many and little is left of it on its site today besides the foundations and a museum with remaining sculptures on display. The site is well worth the visit however and it is in a lovely quiet and green courtyard. The Knights of St. John arrived in 1402 AD and started building their fortress, using the remains of the Mauseoleum of Mausolus as building materials. The Order of Knights Hospitaller’s headquarters were in the Rhodes island and they decided to build another fortress in Bodrum. The four nations of the Order had each a tower built and maintained by their style in the castle: German, English, French and Italian. It was attacked by Ottoman Empire for several times until it was conquered by the Sultan Suleyman the Magnificent in the 16th century. The castle in itself is an interesting place to explore. It has a lovely garden with lots of Mediterranean plants and trees and peacocks walking around. 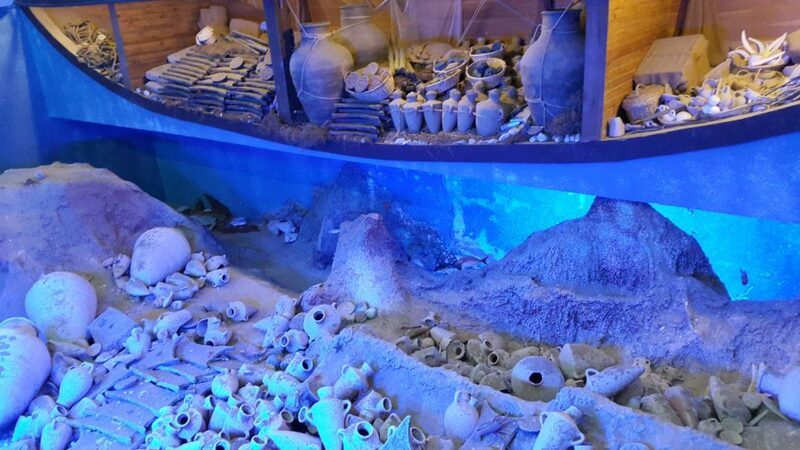 In addition it now houses the award-winning Museum of Underwater Archaeology. There are many fascinating findings from the shipwrecks buried in the Aegean Sea. It is biggest of its kind and includes beautiful objects from Bronze Age, Mycenaean, Hellenistic, Roman, Byzantine, Ottoman eras. 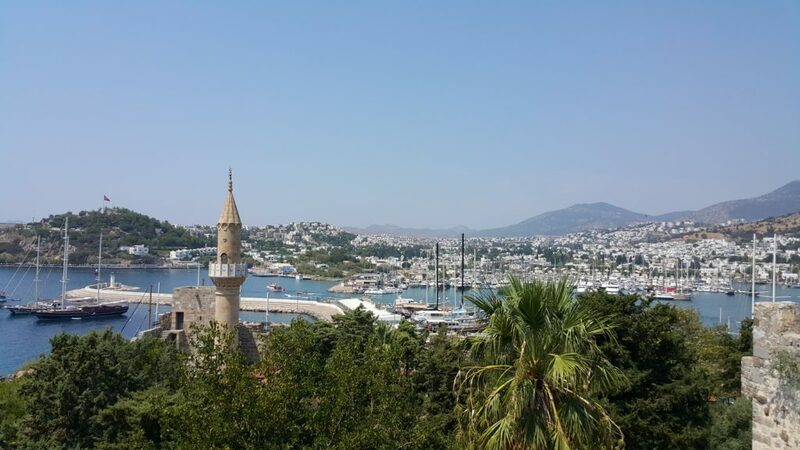 After visiting both the Mausoleum and the Bodrum Castle it is the time to stroll at the seaside promenade and stop for a fresh juice or coffee and a cake at one of the numerous cafes dotting the marina and admire the lovely views over the turquoise sea and the green hilly landscapes. 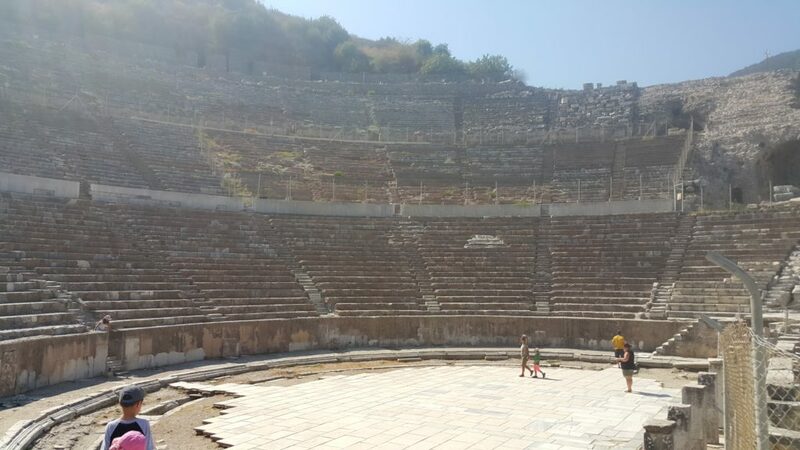 If you still have the energy left to do some sightseeing, then the well-preserved ancient Amphitheatre is worth to visit as well as the Myndos Gate from the time of king Mausolus where one of the bloodiest battle against the Alexander the Great took place. Of course the boat tours are popular here. There are also some lovely seaside villages a short drive away, such as Gümüslük, where we enjoyed a beautiful sunset. It is no wonder that the area is a popular tourist destination and a place to spend holidays for both Turks as well as foreigners. I felt the sizzling heat and while marvelling at the surrounding beauty around and above me as well as beneath my feet, I was also looking for a shade from the brightness of the sun… Cats on the other hand were lounging on the marble pillars and statues, clearly feeling at home, looking sleepily at the tourists passing by… After all, this was the famous Ephesus, a world-renowned ancient city, now a UNESCO World heritage site. I am sure cats were also present in those days when the original residents were going about their daily business. 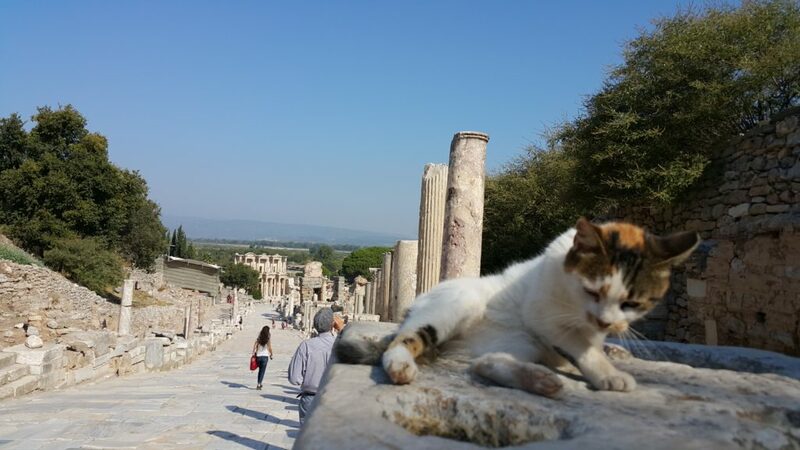 Wouldn’t it be wonderful if some of them were even direct ancestors of the cats who have made the ruins of Ephesus their home today? 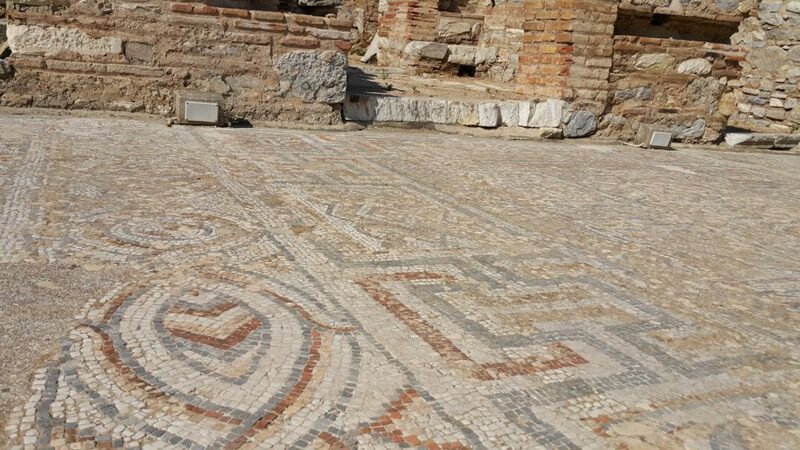 Ephesus has been a remarkable city in many different eras throughout its existence. At first it was one of the twelve cities of Ionian League since 10th century BC. Later it prospered under the Roman rule. It was also a very important location for early Christianity. 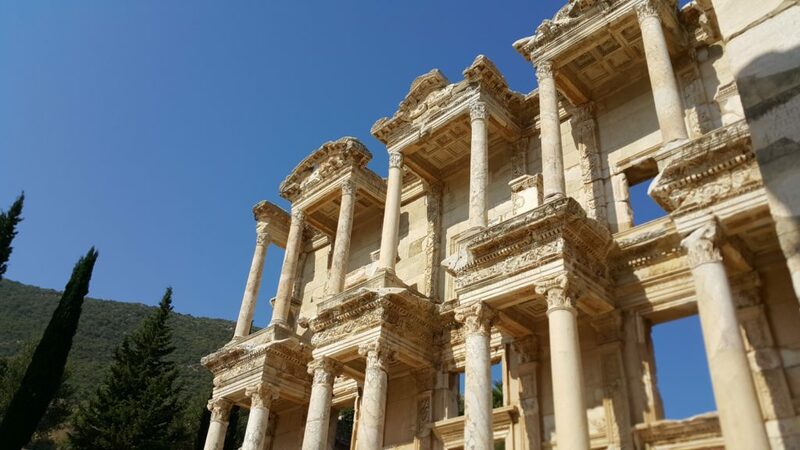 Perhaps one of the best known sites here is Celsus library, with its imposing entrance. I was surprised to see that it was quite simple and not very big inside. Nevertheless, it housed nearly 12 000 scrolls. Another well-preserved site is the theatre, once biggest in the world with the capacity to seat 25 000 people. 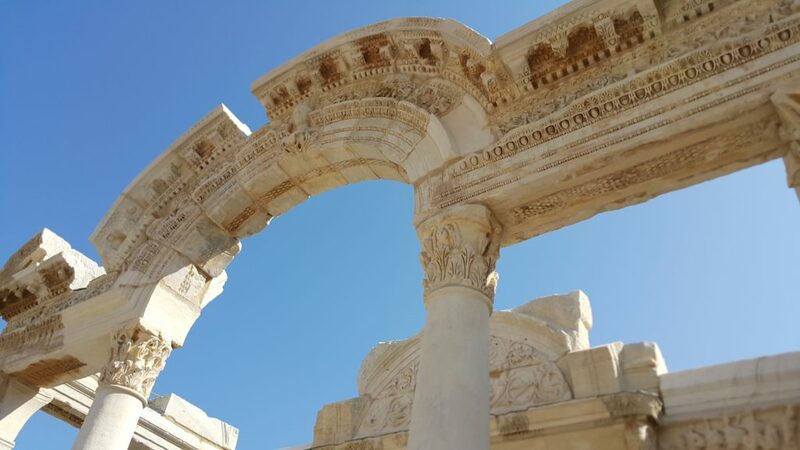 Ephesus is also the home of one of the Seven Wonders of the World, namely the magnificent Temple of Artemis, with its many-breasted Greek-Anatolian goddess Artemis-Kybele. It took more than 100 years to build but unfortunately, hardly anything is remained today. 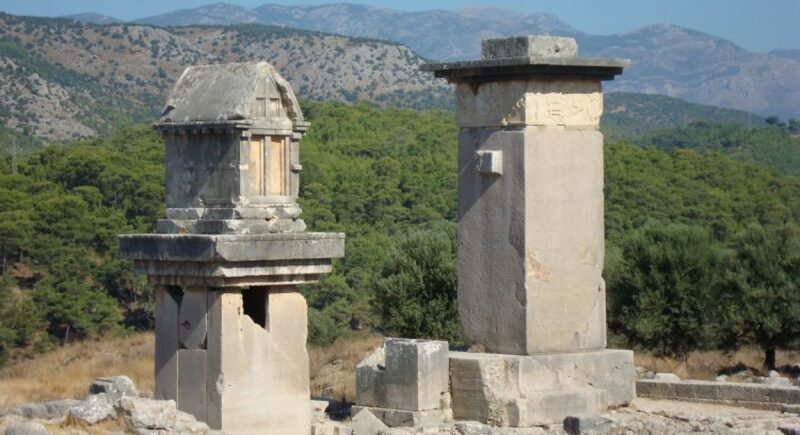 Other notable sites are the Temple of Hadrian, agoras, bath complexes, an advanced aqueduct system and many other interesting sites and artefacts. Among other dignitaries of bygone days, Mark Anthony and Cleopatra visited Ephesus. Perhaps the most prosperous era was the time of Augustus when the city flourished commercially and culturally as well as becoming an important administrative centre, governing Western Asia Minor, and being one of the biggest and most important cities of Roman Empire. From early Christian era, it is thought that Gospel of John was written here and Apostle Paul lived here. According to Roman Catholic Church Mary spent the final years of her life in the house situated near Ephesus. Nowadays it is a popular pilgrimage destination for these reasons. The city was eventually sacked by Goths, destroyed by an earthquake, and its harbour was gradually silted up by Kücükmenderes river, moving farther from the seaways of commercial ships… all this caused the gradual demise in the end. What made the city ‘alive’ for me, besides the iconic cats, were the signs of everyday life in ancient times, like beautiful mosaic floors in private homes, a row of public latrines in the bath complex, the games carved into stone pavements… I could imagine the kids playing on the streets here as if it was just yesterday and people walking at the agoras, choosing fresh fruit and vegetables, bargaining with traders… I have been at Ephesus couple of times but there is still so much I haven’t seen yet. One really must take their time to absorb everything this splendid city can offer.